In 2016, we funded naloxone kits for Seattle Police Department bicycle officers. In 7 months, 14 lives were saved. As a result the entire force will soon carry this overdose-reversing drug. We address school assemblies, community forums, service organizations, U.W. Opioid Summits, Federal Courts, treatment centers, radio, television, Frontline’s “Chasing Heroin” documentary, behavioral health roundtables, the King County Health Board and more. We serve on the Heroin and Prescription Opiate Addiction Task Force and the WA State Stakeholders Task Force on Opioid Addiction. We are planning to support research at the University of Washington’s Alcohol and Drug Abuse Institute to learn how to effectively connect people with lifesaving care. We are also developing school prevention programs targeting at-risk youth. Our testimony before a Washington Senate committee helped pass legislation making naloxone more accessible. We are also building awareness of evidence-based opioid addiction therapies such as Medication Assisted Treatment. We help families emerge from the shadows and guide them through the quagmire of addiction services and treatments. The Marah Project is currently raising funds to help equip Seattle Police Department officers with naloxone. Naloxone, or Narcan, is a life-saving drug delivered intra-nasally that can reverse a heroin overdose if given quickly enough. In Phase One, SPD will equip 70 bike officers with Naloxone kits in specific areas of the city. The University of Washington’s Alcohol and Drug Abuse Institute will be conducting extensive research on this Seattle naloxone project to measure the program’s effectiveness. The roll-out date will be announced soon. This school year we created the Marah Project WEEK to raise awareness in our paid internship program. Each day started with tasty breakfast treats, then a variety of educational speakers and entertainers came to the Middle College: a yoga instructor, an etiquette expert, a musician, the head of a Drug Treatment Center, an entrepreneurship specialist, etc. We moved our internships from spring to summer to make it easier for kids working hard to graduate. Our two winners were Jerry Au and Jacob Watkins. Both were mainstreamed in for instruction and mentoring with the TIPS interns. 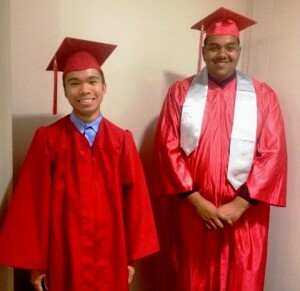 Jerry Au and Jacob Watkins at Middle College graduation ceremony. Three students were chosen for internships, and 2 of them completed the program.